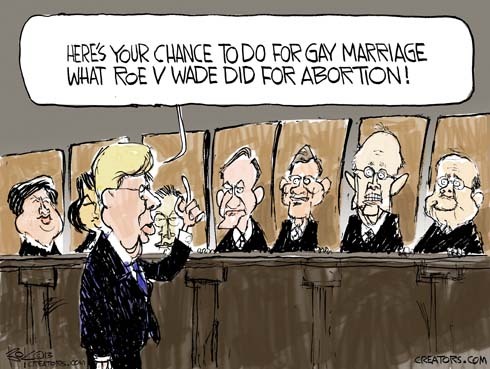 Justice Kennedy isn’t homophobic, he’s Roe v Wade-phobic. He think’s “a democracy should not be dependent for its major decisions on what nine unelected people from a narrow legal background have to say”. 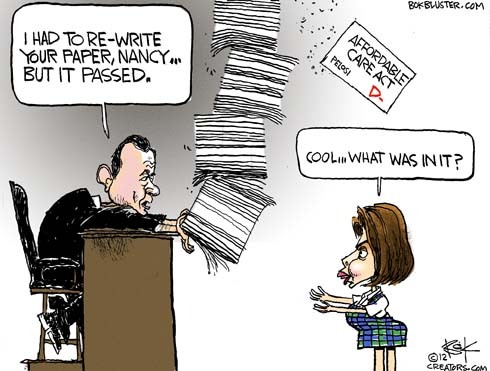 Which is what happened in the Roe v Wade decision. Attitudes toward abortion were already changing and Justice Ginsburg says the court went “too far and too fast“ in removing the issue from the political process. Anger and frustration rages over abortion today with many attitudes shifting back the other way. But nobody likes an abortion. Everybody loves a wedding. 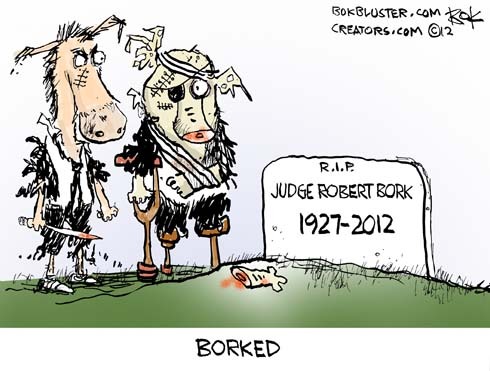 Robert Bork died late this year. He was a distinguished scholar. One of his many distinctions included having a last name as a verb form – “to bork”. 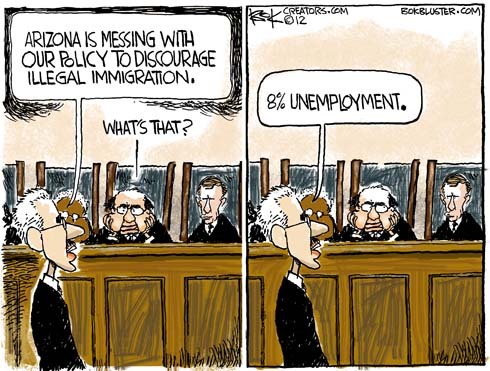 The good judge was borked by Joe Biden and Ted Kennedy during senate hearings on his nomination to the supreme court. The late senator from Chappaquiddick claimed, “Robert Bork’s America” was a place where “women would be forced into back alley abortions and blacks would sit at segregated lunch counters.” A more circumspect Biden would wait 25 years before claiming they would be seated in chains. You’ll have to pass it to find out find out that Justice Roberts gutted the commerce clause according to Tom Scocca in Slate. To which the WSJ says maybe so but he just increased Congress’ taxing power. And Andy Wilson says the Chief Justice “…rewrote the statute in order to save it…” much to the dismay of its previous supporters and lobbyists. The education division of Bokbluster upper management is introducing a new study guide feature. I’ve always thought of cartoons as windows on the news and history. With that in mind I’ll offer study guides from time to time to draw students into the news. The Supreme Court is issuing a rasher of rulings this week. The most prominent decision upheld the individual mandate to purchase health care. 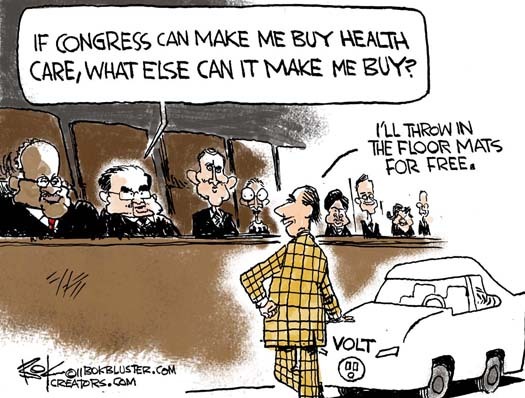 The government argued its healthcare mandate was justified under the constitution’s commerce clause. When Justice Kennedy asked if government “can create commerce in order to regulate it” it looked as if things would go badly for Obamacare. The court determined the mandate is a tax and as such it is constitutional under congress’ taxing authority, not the commerce clause. Now that the individual mandate has been upheld, what are the limits to government power? Should it be limited? What is the commerce clause anyway? In the disputed 2001 presidential election, the Supreme Court ruled George Bush the winner over Al Gore. Needless to say, this got Bush off to a bad start with a lot of people. 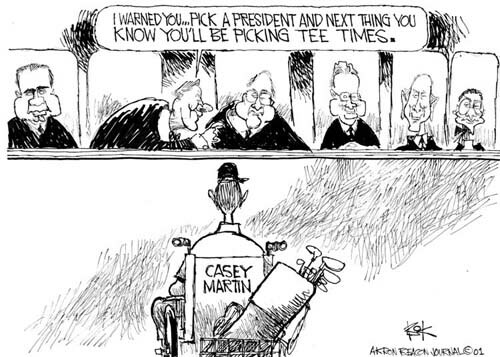 Later that same year the court ruled in favor of a professional golfer named Casey Martin. He was disabled and sued the PGA for permission to play on the tour while riding in a cart. How do you see the Supreme Court’s role in relation to the other two branches of government, the states, and you as an individual? Express your thoughts and feelings in a cartoon. Have fun! While the Supreme Court hears oral arguments over the Arizona immigration law, a Pew study says more Mexican immigrants are leaving the U.S. than entering.